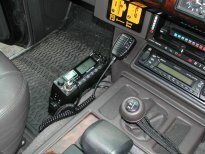 The aim of this section is to give you the information you will need to be able to install a vehicle mounted CB set-up in your 4x4. If you have any questions or queries please just get in touch for individual advice. Performance is dependent on many factors, but when fitted correctly, your CB set-up should give you a vehicle-to-vehicle range of up to 3-6 miles in open country, less in densely wooded or built-up areas, but considerably more from a high position. Obstacles in the way of the signal make all the difference on CB. With nothing in the way, i.e. two vehicles on hills with nothing between them, some incredible distances can be achieved, 30-40 miles or more ! Before you start, you should decide on where you want to put the rig (CB unit) & aerial, and how you will route the cables between them. By the time you have finished reading this section, you should have a fair idea of where you will put everything, but if you’re unsure - give us a call. If you buy a new set, it will come with approx 3’- 5’ of red & black 12v power cable, a bracket for mounting the rig, and a smaller bracket for the mic, along with suitable screws, washers etc. The rig will need connection to 12v power - if you have a 24v vehicle, you can use a 24v to 12v dropper. Many of these are enough to power a car stereo & other bits, so why not put in some extra power connections around the vehicle for other 12v items in the future? If you will only be using the CB occasionally, and will be taking it in and out of the vehicle, and don’t want to fully install it, you can use the cigarette lighter socket (if you have one), but wiring direct to the battery is easy enough, and saves having wires dangling around. 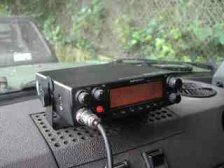 If you want to remove the CB when not being used, it is still worth properly installing it as you can quite easily remove the set from its bracket, and un-plug the aerial & power leads when you want to take it out, and from a safety point of view - it should be properly secured when off-roading. It’s tempting to jam it next to your seat with a jumper round it, or have it loose in a glove compartment or cubby box, but it’s a sharp metal box that you don’t want flying around, should something nasty happen!! It’s really not worth the risk. 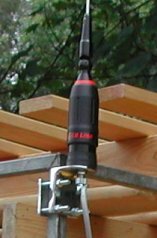 As a general rule, the higher up the aerial is mounted, the better it will work. You should have the aerial in a position where there is nothing too close to it, as close proximity of other objects will have an effect on the SWR reading - more on SWR later. Most mounts will require a hole to be drilled somewhere on the vehicle, although magnetic mounts will stick to steel roofs and bonnets. With “through hole” mounting, you also have the advantages of having the connection & cables inside the vehicle, away from any branches that might snag, and avoiding the hassle of bringing the cable back into the passenger compartment. If you decide to mount the aerial so the cable is outside the vehicle - use tie-wraps with short spacings to make sure you don’t rip the cable off with a passing branch. If you’re talking to someone very close, you might not immediately notice, but damage will be done to the set. 1 Through the roof : You can drill a hole in the roof to mount an aerial. Use a “dome” or “stud” mount for this. If fitting into a Land / Range Rover with an aluminium roof, care must be taken to make a good earth connection. You may need to add a strengthening plate for very large aerials. 2 Rear of the vehicle : This is often the best place to mount an aerial, as you can get the mount high up on the back of the vehicle, but with the aerial mount just below the roof line. This means the aerial will work well - being high, and give it some protection from branches. Pictured here is a full-size Springer, mounted onto the back of a Land Rover 90, using a PSM-1 mount. 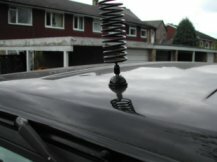 3 Roof rack : If you have a roof rack fitted, this can be a good place to have the aerial. Our mirror mounts will clamp around the bars of a roof rack - you will need to file a small area back to shiny metal (i.e past galvanised layer, or paint) to make a good earth connection. This doesn’t need to be a large area, just so that a part of the mount is making good metal-to-metal contact. The rack itself will act as a “ground plane” or earth - see below. 4 Rollcage : If you have a roll-cage fitted, this is another good place for an aerial - some already have lamp brackets on them, or if you can fabricate a small metal plate and weld it on or use exhaust clamps to secure it. Never try to drill through the rollcage to fit a mount - this will destroy it’s structural strength. 5 Front wing : You can put an aerial on the front wing, as long as it is not too close to the windscreen and rest of the body. At least 2 feet away is best. Again, a “dome” mount is ideal. 6 Gutter mount : Gutter mounts work well on steel roofed vehicles although they are on the side of the vehicle so they can be prone to damage from passing branches and their cables can easily get snagged on things. They are held on by two screws that tighten down into the trough of the gutter - they need to make metal-to-metal contact. With aluminium vehicles you will need to protect this earth connection. The normal way to prevent alluminium from oxidsing is to use a zinc based paint like "Red Oxide" or similar rust inhibiting paints. Obviously, red paint on the outside of the car is less than ideal, so a spray-on (aerosol) plastic sealant will do the trick and not be so visible to the eye. 7 Front bumper / bullbar : On the top of a bullbar is a common place for mounting an aerial - especially in Australia, in fact many ARB products have aerial mounting plates designed in. There is no longer a specific mount designed for bullbars, but I have seen exhaust clamps and plates put together to good use. Do bear in mind that theft from this position might be a problem. Mounting on a standard bumper can work, although the amount of metal around the aerial can cause tuning and performance problems. Also, having a flexible aerial down this low can be dangerous - getting whipped in the face is an off-road site marshals’ nightmare... and it has happened! 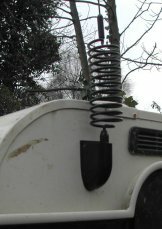 If you do need to adjust the aerial, there is usually a grub screw to loosen at the top of the coil, to allow you to move the whip in and out . Where this is the case, you are acting on the wire “coiled” up inside the coil, so moving the whip in or out by half an inch may actually alter the length by several inches, so small adjustments are needed. It’s often easiest to cut the whip as you will normally need to make it shorter if anything. This should ensure that at least the top channels of the EU band don’t have too high a reading. You may have to do this with small (3’ and under) aerials. You may find that in some circumstances, often with aerials made in Europe, you will need to cut the whip. Do this with some caution. If possible try to find another piece of rigid wire that’s the same length as the whip of the aerial (fencing wire is ideal but a straightened coat-hanger or similar will often do the trick). Use this as the whip and cut it down to size until you find the right length to give you a good reading, then cut the actual aerial down to this size and re-fit. This will prevent you cutting too much off the aerial by mistake, and the wire will probably be a lot easier to cut than the aerial’s steel whip, saving you time. Aerials made in Europe are tuned for the EU band and below, and we want to tune them for the EU band and above, hence why you often need to cut them. Luckily it’s this way around, as it’s much easier to cut a whip down than it is to add anything to it! If your SWR is very high, it's likely that your earth connection (groundplane) is not good - we have more information about groundplanes and curing earthing problems here. Following the advice in this section should mean that you have very few problems installing and tuning a CB set-up. However, if you do get stuck, just give us a call. For all the information we’ve tried to give here - there’s no substitute for individual advice when it comes to solving problems.